Lumenis is a global leader in aesthetic lasers, medical and light based technology. Lumenis is committed to treating cosmetic and medical conditions with its advanced technological solutions. Lumenis offers a wide range of laser systems, which are particularly meant to fulfill your treatment objectives and meet your budget situation. Aesthetic laser and light treatments are by far the most versatile and flexible platform for cosmetic skin treatments. Lumenis is the one thing that caters to your cosmetic enhancement needs while still being affordable and less painful than most surgical alternatives. Hair Removal Treatment: The LightSheer Duet treatment provides high speed hair removal and helps get rid of unwanted hair from virtually any area of the body. LightSheer Diode Laser System provides a high power and both short and long pulses to safely and efficiently treat all types of skin including tanned skin. The revolutionary high speed LightSheer along with its significantly increased spot size and the innovative vacuum assist technology allows treatment of larger areas like the backs and legs. Treatments are comfortable and take around 15-20 minutes without having to use any treatment gels and topical anesthetics. This treatment is affordable, reduces treatment times by almost 75% and provides permanent hair removal. There aren’t many hair removal treatment solutions that offer the similar combination of product excellence as the Lightsheer duet treatment. Leg Veins: Lumenis combines two extremely effective technologies to treat those visually unpleasant leg veins. It uses the adaptability of the Intense Pulsed Light at ranges of 515 to 1200 nm in order to reach smaller and superficial red vessels and high-energy pulsed laser light at a range of 1064 nm in order to treat deeper blue veins. Skin Treatments: The IPL treatment enhances the appearance of photo aged skin, removes sun induced spots or freckles, redness caused due to broken capillaries, and nearly all benign brown pigments via a treatment procedure known as photo rejuvenation for the face and body. The skin treatments using photo rejuvenation cause fewer side effects and need barely any alteration in the normal routine of a patient. The IPL treatments are gentle, quick and non-invasive. Patients can notice remarkable results within a short period of time. By getting rid of the unpleasant looking age spots and broken capillaries, patients can achieve a radiant and younger looking skin. Pigmented Lesions: The IPL technology used by Lumenis effectively treats pigmented lesions. Due to its versatility of filters, the IPL technology effectively treats hairy-pigmented lesions. During treatment, the wavelength is optimized in order to allow the energy to be absorbed by only the unwanted melanin and raising the temperature to cause the shattering of pigments. Soon after treatment, the melanin or unwanted pigment cells are thoroughly fragmented without causing any damage to the surrounding tissue. Skin Resurfacing: The UltraPulse Encore is a laser designed to provide a precise, efficient and long-lasting process of skin rejuvenation. The wavelength of light, which is emitted by a CO2 laser, is absorbed very well by the water present in the skin. It eliminates wrinkles, lines, dark spots scars and other skin related problems layer by layer. This process additionally stimulates the formation of new underlying collagen in order to provide improved elasticity and support for the skin. Tattoo Removal: Many attempts of tattoo removal offer less than desirable results. Here is where the Q-Switched Nd: YAG laser provides a solution. It delivers light of a specific wavelength in very short and extremely high peak energy pulses. This gets absorbed by the pigment in the tattoo, resulting in an acoustic shockwave. The shockwave created destroys the pigment particles, removing them from their encapsulation and breaking them to fragments that are small enough to be expelled from the body. 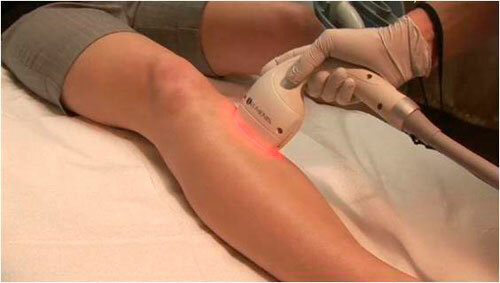 The laser delivers high intensity light in pulses into the area of treatment. The tattoo ink selectively soaks up the light without causing any damage to the normal skin tissue around it. The ink is broken into small particles that can be safely removed from the body in the weeks following the treatment. Lumenis treatment modules deliver precise results with marginal discomfort and fewer side effects. There are many internally integrated safety features that make the Lumenis treatment modules extremely safe. Every module is designed along strict safety lines and regulations.